Get ready, because I’m about to blow your mind. Not only am I going to show you how to make cheese fondue at home, but I’m going to make it so easy that there’s no way you can mess it up. Fondue is such a fun way to gather friends with everyone sitting around the table dipping into a communal pot of cheese. It just doesn’t get any better than that. The word, “fondue,” is a form of the French verb, “fondre” which means “to melt”. So when you eat cheese fondue (or “fromage fondue”), you’re literally eating “melted cheese”. We have the Swiss to thank for cheese fondue. In the wintertime, when people had less access to fresh foods, they developed it to use up their aged cheese and stale bread by cooking the cheese with wine and dipping the bread in it. This meal became a Swiss classic and was promoted as the national dish in the 1930s. It was introduced in America at the 1964 World Fair. Ever since then, Americans have adopted this Swiss meal as their own with fondue parties and even fondue restaurants, like The Melting Pot. 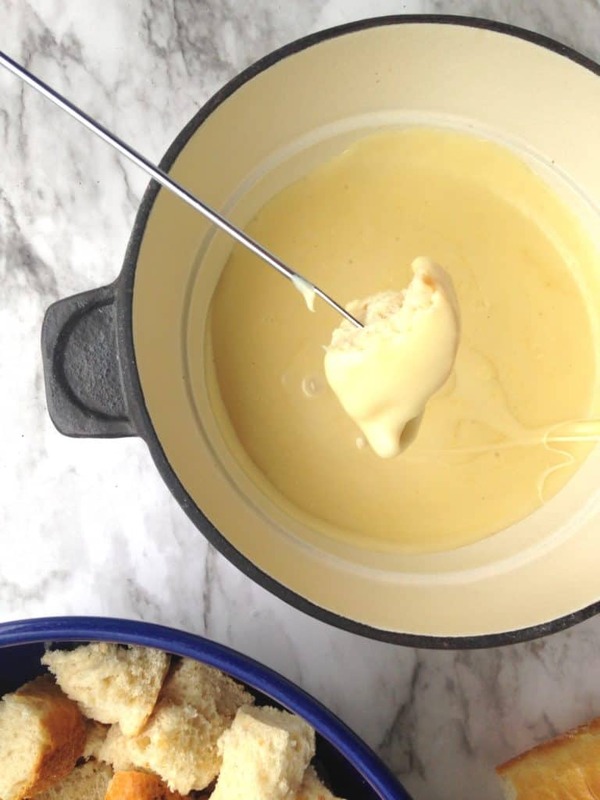 If you’ve eaten fondue in a restaurant, you might think it’s complicated to make it at home. I mean, you pay good money for a nice fondue experience, right? 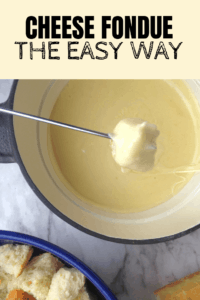 What if I told you that making cheese fondue can be both easy and more affordable when you make it at home? It’s a boxed cheese fondue mix. Now, don’t get all cheese snobby on me. Fondue mix is good — like, really good. I like it better than homemade fondue or the fondue that you get at The Melting Pot. In fact, every year, my family eats cheese fondue made from a mix on Christmas Eve. It’s our family tradition, and it couldn’t be any easier to fix. You literally cut open the package and heat it up. You can usually buy cheese fondue mix at your major grocery store if you live in a big city. But you can also buy it on Amazon. If you’re feeding 8 people or less, you’ll want to buy packs of this Emmi brand cheese fondue. Each pack feeds 2 people; I’ll let you do the math for the number of people eating at your table. If you’re feeding MORE than 8, you’ll save money by buying this 6-pack of Swiss Knight cheese fondue. That amount of cheese will feed 12 people, and when you look at the price per person, you’ll be amazed! So much cheaper than going to a restaurant. To make fondue, you need a fondue set. And there are two different types. With a traditional set, you heat the cheese and keep it warm using a Sterno can that sits under your pot. Some sets will even have a special container to set the Sterno can down in. A traditional pot is nice because you’re not reliant on electricity or dealing with power cords, plus, it’s traditional. Click here to see the top 7 traditional Swiss fondue sets on Amazon! This fondue pot has the best reviews on Amazon. It’s a little on the pricier side, so grab it if you see it under $100! An electric pot just plugs into an outlet and keeps your fondue warm. A lot of people prefer them because they’re less expensive than a traditional set. Click here to check out the top 6 electric fondue pots! This well-rated electric fondue pot is a great choice if you’re looking for affordability. Making cheese fondue from a mix is so easy that my 4-year-old could do it. So easy and so good. Cut open the package and pour the cheese into your fondue pot. Heat the fondue pot on medium heat and stir frequently. Or if you want to melt your cheese faster, just pour it into a microwave-safe bowl and heat it up a few minutes at a time, stirring every so often. Then transfer it to your fondue pot to keep warm. Let me know if you try one of them and like it! Baguette is the traditional and most popular cheese fondue dipper, but you can use any kind of speciality bread that you’d like. Just make sure to toast your bread cubes to give them a little more oomph when you dip. There are lots of other things you can dip in your fondue, too, especially if you want to include more veggies in your menu or if anyone in your group is eating a Keto diet and can’t have bread. Invite friends for a fondue potluck. You provide the cheese, and everyone else can bring a different dipper to share. Host a big cheese fondue party. You provide all of the food, and each person brings $5 to offset the cost of the fondue (it’s a lot cheaper than going out to a restaurant!). Put together a cheese fondue food bar. Arrange all of the dippers in a buffet line and at the end, place 2-3 fondue pots with different types of cheese fondue. Use the recipes above, and you could even include some tortilla chips and queso as an option. Develop a new holiday tradition. Like I mentioned before, my family eats cheese and chocolate fondue every Christmas Eve. Even my kids look forward to eating it because it reminds them of Christmas. It’s a perfect (and delicious) way to elevate a holiday or a special evening. 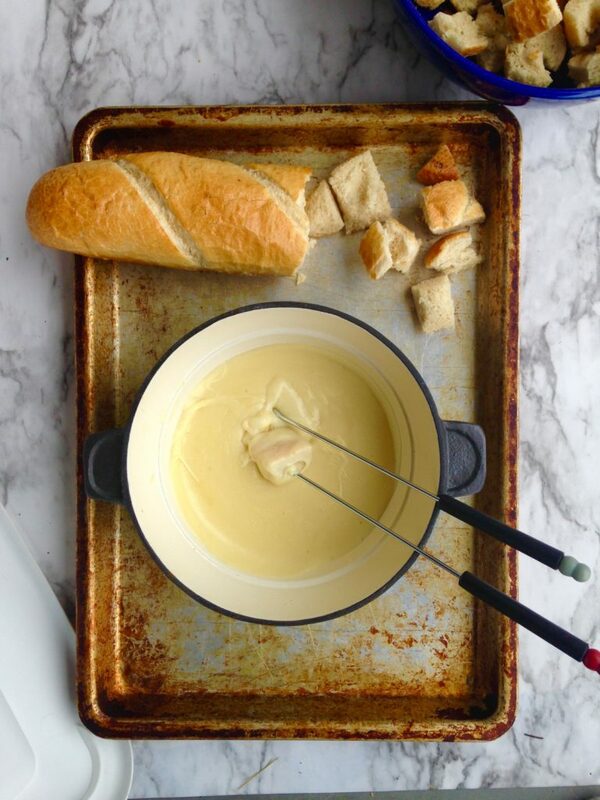 Make cheese fondue a date night. A package of Emmi cheese fondue is the perfect amount for 2 people. Top it off with either some chocolate fondue or chocolate-covered strawberries, and you’ve got the perfect date! Soooo…what do you think? 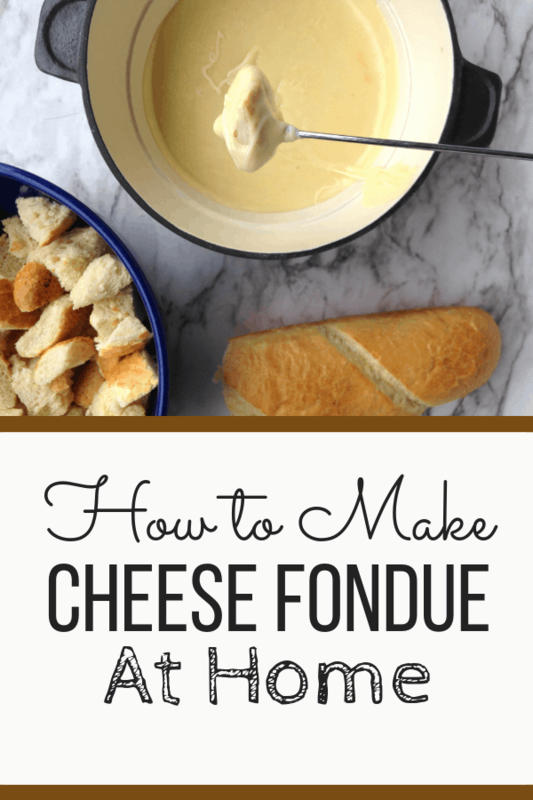 Are you ready to make cheese fondue at home? 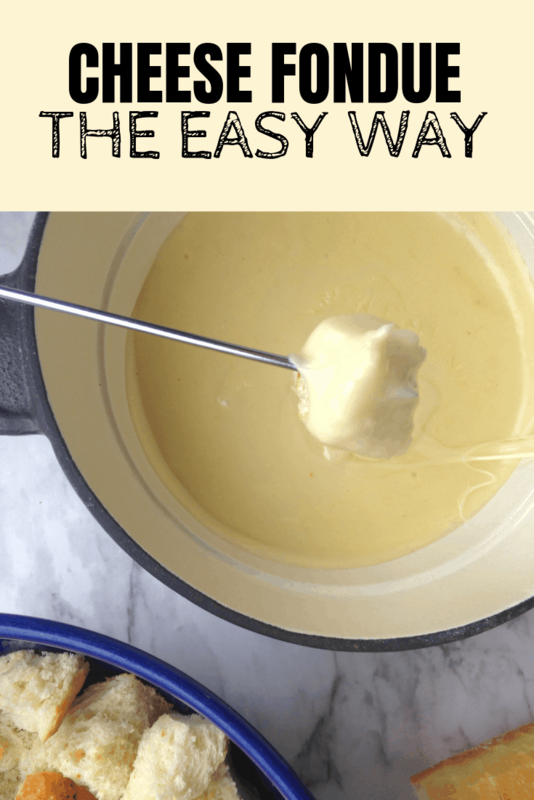 Whether you make your fondue from scratch or cheat and use a mix, eating cheese fondue with friends is easy, fun, and a unique way way to spend an evening together. Plan a fondue party for your next get-together! If you like this post, you’ll like 13 Charcuterie Board Ideas for Easy Entertaining and The Best Charcuterie Boards For Sale on Amazon and Etsy!